The Young and the Restless (Y&R) spoilers for Friday, November 23, tease that Thanksgiving will come a little late in Genoa City. Thursday’s episode will be preempted, so Y&R will let all your favorite GC residents celebrate on Friday. Of course, Sharon (Sharon Case) will keep one very important tradition alive on this holiday. She’ll serve the homeless with some help at Crimson Lights. The Rosales family will pitch in this Friday, so expect some sweet moments between Rey (Jordi Vilasuso) and Sharon (Sharon Case). They’ve agreed to keep their distance, but that’s kind of tough when Sharon works with Rey and happens to be his landlord. He also comes in the coffeehouse all the time and now he’s working on this community service project with her. In other words, there’s no way Rey and Sharon could ever steer clear of each other. That could be a big problem for Mia (Noemi Gonzalez), but she’ll try to keep her jealousy in check on Friday. The Young and the Restless spoilers say Rey and Mia will come together for once. They’ll put their conflict to rest and agree to move forward, but something tells us troublemaker Mia could sabotage herself! Lola (Sasha Calle) should be at Crimson Lights for the homeless event as well. Will she pick up on the weird vibe between Mariah (Camryn Grimes) and Tessa (Cait Fairbanks)? Lola hasn’t known them all that long, but they’ve already become fast friends. She’ll probably be able to tell that something’s not quite right. Despite her lies, Tessa’s trying her hardest to repair the damage. As for Mariah, she’s teamed up with the cover-up crew to dupe Tessa and destroy any chance of taking them down. 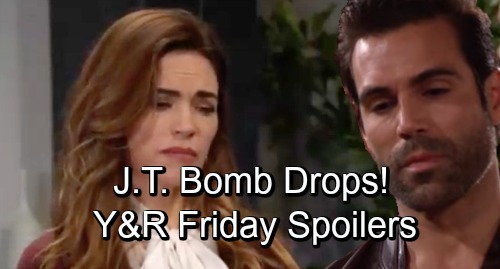 However, we could see some cracks in the scheme on Friday’s Y&R episode. Thanksgiving tends to bring the warm fuzzies, so Mariah just might see a glimpse of the person she fell in love with. That Tessa’s still in there. She does a lot of messed up things, but Tessa doesn’t behave maliciously. Even now, keeping the money is undoubtedly about lack of trust and self-preservation. Mariah’s indeed deceiving her, so the fact that Tessa wants a security net is understandable. Over with Nikki (Melody Thomas Scott) and Victoria (Amelia Heinle), they’ll get quite a shock. The Young and the Restless spoilers say Rey’s investigation will turn their world upside down. They don’t think Rey has anything to go in J.T.’s (Thad Luckinbill) murder case, but it seems they’re wrong about that. Friday’s cliffhanger could bring a bombshell that changes the game. Will whatever Rey learns next ultimately lead to charges and some arrests? We’ll give updates as other Y&R news comes in. Stick with CBS soap and don’t forget to check CDL often for the latest Young and the Restless spoilers, updates, and news.